American violinist KURT NIKKANEN was born in Hartford, Connecticut, and began his violin studies at the age of three, later studying with Roman Totenberg and Jens Ellerman. At twelve he gave his Carnegie Hall début, performing with the New York Symphony; two years later he was invited by Zubin Mehta to perform the Paganini Concerto No. 1 with the New York Philharmonic for a Young People's Concert. He studied with Dorothy DeLay at the Juilliard School. In a distinguished international career he regularly receives invitations from the leading orchestras in the United States and Europe, and has toured Japan and the Far East, collaborating with many leading conductors. 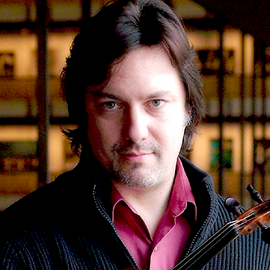 An enthusiastic advocate of contemporary music, he has given numerous performances of the John Adams Violin Concerto, and other contemporary projects include Aaron Jay Kernis's Concerto for violin and guitar, which he performed at the 1998 Aspen Festival, HK Gruber's violin concerto Nebelsteinmusik and the world première of John Zorn's Contes de Fées. Steven R. Gerber's Violin Concerto was written especially for him.